For the first time since its blitz across Syria and Iraq, in 2014, the Islamic State is on the defensive in both countries. Its caliphate, led by Abu Bakr al-Baghdadi, is shrinking. Its numbers are down. It hasn’t launched a new offensive since May, 2015. The new U.S. Expeditionary Targeting Force in Iraq—led by some fifty Delta Force commandos—has scored the first capture of a key ISIS operative, the Pentagon said on Tuesday. The Iraqi military, meanwhile, is tightening the noose around Mosul, an ISIS stronghold and the country’s second-largest city. In Syria, a fragile new ceasefire, which took hold last weekend between the government and the rebel opposition, has turned attention on the Islamic State. Yet ISIS, also known as ISIL, has become a global phenomenon in the course of the past year, attracting pledges of fealty from extremist groups on three continents. It remains the world’s wealthiest terrorist organization, and the first to create its own state, from large swaths of both Iraq and Syria, with a capital in the Syrian city of Raqqa. 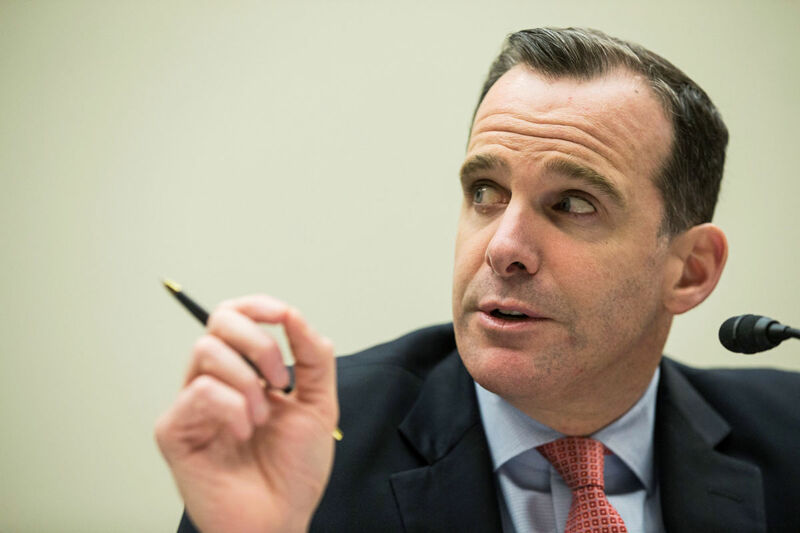 Brett McGurk, a diplomat who has been involved in U.S. operations in the Middle East since the 2003 invasion of Iraq, began his Washington career as a law clerk to the late Chief Justice William H. Rehnquist. He was one of the main architects of the U.S. military surge in 2006 and 2007, which pushed back Al Qaeda forces in Iraq. McGurk also led fourteen months of secret negotiations with Iran on a prisoner swap, which finally culminated in freedom for five Americans in January. He is now the Special Presidential Envoy for the Global Coalition to Counter ISIL. On March 1st, McGurk reflected on the American-led campaign against ISIS during a conversation in his first-floor office at the State Department, just hours before leaving for Iraq. The interview has been condensed and edited for clarity. How strong is ISIS, militarily, today? At its height, it had some thirty-five thousand fighters, from a hundred and twenty countries. Current assessment: about nineteen thousand to twenty-five thousand fighters in Iraq and Syria— the lowest assessment since 2014—divided fairly evenly, but dominated increasingly by foreign fighters. Suicide bombers are nearly all foreign fighters. Tunisians, Belgians, Saudis, Libyans, all coming into Iraq and Syria to blow themselves up. As the Syrian civil war really started going, this major attraction of foreign fighters began ticking up to twenty, thirty, forty, sometimes sixty a month of suicide bombers, which showed us that we had a supercharged global network on our hands. Suicide bombers are just really pernicious. Major military operations are usually led by a wave of suicide truck bombs. We just had a number of suicide bombers in Baghdad, in Shia mosques, trying to re-spark some sectarian conflict. How are they still making it into both Syria and Iraq, most notably from Turkey? Why hasn’t the world been able to stop them? It is much harder for them to get in now than it was even six months ago. We can track that by the numbers but also by the information we’re seeing from ISIL’s own sources. Their open sources—like Dabiq magazine—are saying, “Think about going to Libya now.” So we’re seeing a migration out of Syria, out of Iraq, because life is pretty horrible for ISIL inside Syria and Iraq. It’s much harder for them to get in, and, once they’re in, much, much harder for them to get out. The entire Syria-Turkey border, a year ago, was controlled by ISIL. Now it’s a ninety-eight-kilometre strip of border, and we’re going to work to make sure that continues to shrink. How many people has ISIS lost in fighting and in airstrikes in the past two years? At one point, in 2015, the U.S. estimated that ISIS was losing a thousand fighters a month. It’s in the tens of thousands, low tens of thousands. If ISIS is weaker, why haven’t the array of forces on the ground, particularly in Iraq, backed by dozens of daily airstrikes by the U.S.-led coalition, made more headway in ten months? The U.S. goal is to “shrink the core of ISIS in both Iraq and Syria,” but that still seems a very long way off. From where it was in the summer of 2014, ISIL has lost forty per cent of its territory in Iraq. It’s lost Tikrit, an iconic Sunni city. It lost Ramadi. It’s lost its connections between Mosul and Syria, losing Sinjar and a number of critical road connections. ISIL is increasingly shrinking. It takes time. It takes intelligence. It takes relationships. It takes ourselves getting established and reëstablishing networks, which we had to do. And in Syria? What percentage of territory has ISIS lost there? Again, it’s increasingly squeezed. Its connection from Syria, its main connection into Iraq and the Tigris River Valley, has been severed over the last week. We severed it by working with a diverse force, about six thousand men—about forty per cent non-Kurd, sixty per cent Kurd—working together to take the town of Shaddadi. We thought the operation would take about six weeks. It took about six days. Shaddadi was a stronghold of ISIL. When ISIL took Sinjar Mountain, in 2014, and captured thousands of Yazidis and Yazidi women, it brought them to Shaddadi to market them off. It was the heart of their perverse caliphate. So, in Syria, they are increasingly under pressure. Syria is a different situation from Iraq, of course. In Iraq, we’re working with the government, with an army. In Syria, we’re not. So it’s much more complex, much more difficult. The overall territory that ISIL has lost in Syria is less than in Iraq, but the strategic nature of the territory is quite important. It’s the border with Turkey, and it’s cutting off these road connections between Syria and Iraq. The over-all campaign to defeat ISIL globally—we’re talking a multi-year campaign. But I just don’t want to put a time frame on something as inherently uncertain as warfare. What is the state of ISIS’s finances? In December, an internal ISIS document leaked to the press claimed that it was forced to cut the salaries of its fighters by half. ISIS has many other sources of funding—from taxes, oil smuggling, extortion, and donations. What are its reserves today, and how have they been affected since the U.S. began striking ISIS oil tankers, in November? We assessed that ISIL was taking in about a billion dollars a year: five hundred million dollars in oil and gas and five hundred million in other forms of revenue—taxes, extortion, antiquities, kidnapping. You have to go at it two ways. In the latter pot, you have to take away their territory. In the former pot, we have to determine how they are getting oil out of the ground, how they are moving it around, where it is going, and then how we can effectively target that. It took a great deal of very hard, very detailed intelligence work about how this is all working. It’s not as easy as, “Oh, let’s just go out and bomb the trucks.” That’s not going to be effective. We really wanted to rip out the spine of their ability to generate revenue. The Abu Sayyaf raid [in Syria in May of 2015] was critical. We did a Special Forces operation to capture Abu Sayyaf, the No. 1 financier in ISIL, right outside Shaddadi. It ended up killing him and capturing his wife. We got more sensitive site exploitation—the S.S.E.—off of that raid than from any Special Forces raid in history. We learned an awful lot. We’ve already reduced their economic generation, oil and gas, by thirty per cent or so. This is not going to stop. We’re learning more and more every single day. A good example, in Iraq, is Mosul. How are they paying their fighters? Where’s the money? They’re not going online and wiring money to their fighters. So let’s try to figure out where’s the cash. And we found the cash-storage sites. The President said the other day that their cash reserves are literally going up in smoke. So these are ten warehouses holding cash? Hundreds of millions of dollars. So their ability to pay their fighters is cut by half. Taking out their source generation, taking out their ability to store cash, to pay their fighters and terrorists and fund operations—it’s all part of a very complex but also very comprehensive campaign. ISIS may have lost a lot of men in Iraq and Syria, but it has spawned affiliates faster and farther than Al Qaeda ever did. In two years, it has cultivated more than forty organizations, in dozens of countries on three continents, from West Africa to East Asia. By early 2016, it had formally embraced groups in eight countries, adding an estimated fifteen thousand additional fighters beyond those in Iraq and Syria. That gives it new reach and depth. There are enough men in Libya alone that the area around Sirte is considered ISIS’s first colony. What does that tell you about ISIS outside Iraq and Syria? They are attracted to the notion of this historic caliphate. We’re focussed on the global networks, foreign fighters, financing, propaganda, and the affiliates. But you also have to keep this in perspective. This is not al-Baghdadi sending paratroopers out to Nigeria to establish an ISIL caliphate. Nigeria had an existing terrorist problem, with Boko Haram, which is now flying the flag of ISIL. It’s similar in Afghanistan, Yemen. You have existing problems, terrorist problems, which would be there absent ISIL, and they fly the flag of ISIL. What we are most focussed on is when we see leadership transfers, man-power transfers, real connections between the ISIL core and an affiliate. That’s something, obviously, that we’re going to pay attention to—when that matures into actually controlling territory and planning for external operations. And Libya meets those tests. When we see a threat emerging, the President has not hesitated to order a strike. ISIS has not launched a new offensive since May, 2015. Why? Without discounting how difficult this road is from here, because I don’t want to leave any sense that we’ve turned a corner or anything like that, the organization in Iraq and Syria is significantly degraded from what it was a year ago. It used to be able to mass force and maneuver in very sophisticated military operations. We have not seen those in some time. It is still able to mount suicide attacks and do things in little localized areas. In most of ISIL’s propaganda, it’s this war of flags. But ISIS is still active in cyberspace. Twitter announced last January that it had cut off a hundred and twenty-five thousand Twitter accounts related to ISIS, and yet they are still able to recruit. What is the United States doing about it? Some things are hard to measure. Some things you have to sense. If you’re doing a media campaign for the Washington Redskins, and you’ve lost ten games in a row, you’re going to have a difficult media environment to tell a positive story in. If you’ve won ten games in a row, it’s going to be much easier. So was ISIL’s messaging campaign and messaging strategy really flying high when it looked like they were an unstoppable force? Yes. Is it different now? It’s totally different now. Their chief spokesman’s statements used to be about expanding the caliphate. Now he is trying to explain away their defeats, and saying they’re being tested because Allah is testing them. That’s a very different message. We’re also, in the realm of cyberspace, establishing 24/7 counter-messaging fusion centers, in the United Arab Emirates and Malaysia and elsewhere, because each part of the world has a different audience. They are combatting, every day, the various messages that ISIL is putting out. The gore and the violence get most of the attention, but that’s actually, proportion-wise, one of the smallest segments of ISIL’s over-all messaging. The majority of their messages are sun-drenched scenes of children eating ice-cream cones and of families—this idealized, utopian vision, which is totally a lie. So we’re working with the private sector—with Twitter and Facebook and YouTube—and with our partners around the world, particularly on ISIL’s religious-based messaging, which we can’t counter effectively as Americans but many of our partners can. The main vulnerability in their messaging is that it is not an inherently victorious movement, because it’s quite the opposite. In January, the Pentagon said that, so far, the total cost of the operation against ISIS, beginning in August, 2014, has been about $6.2 billion, an average of about $11.5 million a day. That seems like an open-ended financial commitment. We’ve learned an awful lot of lessons over the last ten years. We’re trying not to repeat certain mistakes. Our presence in Iraq is small. It’s sustainable. It’s focussed on training and advising. It comes with the full consent of the Iraqi government. The budget submission that the Defense Department is putting in is about $7.5 billion dollars for 2017— about a fifty-per-cent increase. Given that we know more about this organization than we ever thought we would, given that we have begun to degrade it from the inside out, we have some real opportunities to accelerate the campaign, in Iraq and in Syria and globally, and we want to take advantage of those opportunities. We have the fragile ceasefire in Syria. Is there a formula for Syria’s political future? Is there a quiet agreement, behind the scenes, about transition and how much Assad will be allowed to participate? Or are we really so raw that nobody has a single idea? We do have, for the first time in five years, all the external parties at the table—including Iran, Saudi Arabia, and everybody—to focus on those questions, which ultimately have to be decided by the Syrians. But you have to have some consensus among all these external parties about the basic framework for how this is going to be resolved. You had that locked into a U.N. Security Council resolution at the end of last year, which talks about a six-month transition formula, followed by elections in about eighteen months. But the first step is to stop some of the bleeding. That is why Secretary Kerry has focussed so much energy and attention on a cessation of hostilities, to open up the space for humanitarian access. We’re four days into this, and it’s going to be extremely difficult, and it’s going to require all sides to live up to their commitments. And, through that, the external parties can help nurture a political discussion, which leads to a political transition, which can help end the civil war. Everybody has to do all they can to see it through. Looking at this in any way you want, there is no way conceivable that Assad’s writ will ever extend throughout the country again. It’s just not realistic after everything that’s happened. So we have to find the formula for that transition. What lessons have you learned from Iraq, and from Afghanistan, that you’re applying to make sure that we’re smarter or more effective than we were the last time? We have to have real humility about our ability to affect the course of events. We have to have our eyes wide open about the unintended consequences of different courses of action. We have to recognize that these are such dynamic environments, with their own culture and history and traditions, that our ability to fully tap into them and understand everything that’s going on is not entirely realistic. We have to be really careful before we get overinvested. We have to define our interests very narrowly and focus very aggressively on achieving those interests. But we have no choice but to do all that we possibly can to defeat ISIL.